Oranges are at their best in the winter and they are the stars of the show in this stunning dessert. Why not decorate it with little ginger-cake houses for something different this Christmas? 1 Cut the cake into 3–4 long slices, then into triangles (or little houses, if you prefer) and use to line the base and sides of a large glass serving dish. Grate the zest from 2 of the oranges. With a serrated knife, remove the peel and any white pith from all of the oranges. Cut away the segments so that they are free of skin, working over a bowl to catch any juice. 2 Measure all the orange juice to give 150ml, making it up with extra juice if necessary, then mix the juice with the sherry. 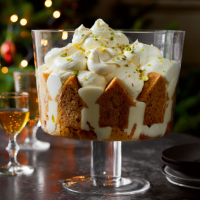 Reserve 5 tbsp of this mix for the syllabub and pour the remainder over the ginger cake. Arrange the orange segments over the cake and spoon over the custard to cover the fruit. 3 Whisk the cream until just thickened then whisk in the grated orange zest, caster sugar and reserved juice and sherry mix. Whisk until thick enough to just hold its shape. Drop spoonfuls over the custard to cover completely. Scatter with the toasted chopped pistachios and chill until ready to serve. To toast pistachios, dry fry in a non-stick frying pan until golden then cool. Make the trifle, cover and keep in the fridge for up to 6 hours, adding the pistachios just before serving. This recipe was first published in Thu Nov 06 16:52:00 GMT 2014.